The outsiders fled, but Yin Yanan didn’t pursue them. Instead, she went to collect the dead foreign Qi warriors’ rings of holding, and afterwards, summoned her air-transportation spiritual tool. Mu Biqiong pondered her words briefly, then jumped on board without saying a word. Then, the girls threw inquiring gazes at Nie Tian. Eyes narrowed, Nie Tian had already unleashed his nine Heaven Eyes to track the three outsiders. However, the speed at which the three of them fled was much faster than he had expected. Pergson, the Bonebrute, had vanished into the earth, his aura too faint to track. The other two traveled as fast as lightning. Even the Heaven Eyes failed to keep up, and soon lost track of their auras. Yin Yanan then started the air-transportation spiritual tool. The three of them fell silent. Even though they had fought the outsiders off, they didn’t seem to be happy about their victory at all. The three outsider youngsters’ mighty strength deeply worried them. The three of them were only at the sixth grade, which meant they should have had the battle prowess of Profound realm Qi warriors. However, their actual battle prowess far exceeded their grade. The Bone Shatterer’s shocking might had left a deep mark on Nie Tian’s mind. The Flame Star, which Li Ye had spent great time and effort to forge, had accompanied him for many years. He hadn’t expected that the Bone Shatterer would have shattered it with a single strike. The Flame Star had been customized to suit the three types of power he practiced. He had been able to infuse it with flame power, wood power, and star power, which had made it very agreeable to him. He had thought it would accompany him for his whole cultivation path. The destruction of the Flame Star came as quite a blow to him. If the Bone Shatterer hadn’t cracked the Dao Enlightenment Rock and awoken the eighth grade Frost Blood Python from its meditation, he would still be avoiding Pergson’s pursuit empty-handedly by casting Starshift repeatedly. It was very consuming to cast Starshift, and he had already infused half of his star power, along with his other powers, into the Flame Star to defend against the Bone Shatterer. If that battle had gone much longer, he would most likely have used up his star power and ended up being killed by the Bone Shatterer. Nie Tian had also noticed this. The two of them had seen the two demonic flowers inside of her up-close in the Realm of Shattered Earth. This time, she had only used the root of the black flower in her fight against the high-tier Demon, and she had already been at a clear advantage. If she had gone all-out, and unleashed the root of that multicolored flower too, then she would have probably killed that Demon within a short time. If the high-tier Demon had died, she would have been able to join Yin Yanan in fighting Froste, the Phantasm youngster, and the final results might have been different. Almost every Demon clan from the Second Demon Realm had ninth grade grand patriarchs. Rumor had it the most ancient Demon clans from the Second Demon Realm had even produced tenth grade grand monarchs at certain points. The five major sects and three major clans from the Domain of Heaven’s Boundaries had contact with a number of Demon clans. However, almost all of them were from the fourth and the fifth Demon Realms, with very few from the Third Demon Realm. That was because, starting from the Third Demon Realm, the Demon clans began to have ninth grade grand patriarchs. Any Demon clan that had a ninth grade grand patriarch would be stronger than any sect or clan in the Domain of Heaven’s Boundaries. Not to mention the clans from the Second Demon Realm. Recalling the scenes of the foreign Qi warriors who had come to derive enlightenment from the Dao Enlightenment Rock being cut down like chickens and dogs, they realized that their opponents this time must be outstanding youngsters of their respective races. With these words, Yin Yanan brought out the rings of holding she had collected and sent her soul awareness inside. Both Nie Tian and Mu Biqiong sent their soul awarenesses into the discarded rings of holding. After a short while, they both withdrew their soul awarenesses. Just as Yin Yanan had said, there were only a number of spirit stones and very few spirit jades within those rings of holding. As for their medicinal pills and spiritual tools, they didn’t take a liking to any of them. With a plain tone, Mu Biqiong chimed in, “Their domain might be more advanced than the Domain of Heaven’s Boundaries, but their status must not have been very high in their sects or clans. I guess they were nothing but regular disciples or clan members. Sects and clans that had Saint domain experts should be as powerful as the Divine Seal Sect, the Bliss Mountain Sect, and the Thousandsword Mountain Sect at the very least. Their chosen ones must carry extremely powerful spiritual tools, and have all kinds of valuable spiritual materials and medicinal pills in their rings of holding. Duan Shihu and Jing Rou were what chosen ones from powerful sects should look like. They had even been given the Realm of Withering Flame as their own headquarters. This was enough evidence of their transcendence. Powerful sects had tens of thousands of disciples. Of course not all of them were wealthy. Days passed as the three of them each practiced cultivation in silence. Nie Tian had suffered the greatest losses from this battle. Not only had he lost the Flame Star, but the Bone Blood Demon had also lost a considerable amount of death power to the Bone Shatterer, which had greatly undermined its battle prowess. In Nie Tian’s senses, the Bone Blood Demon could barely handle an early Soul realm Qi warrior now. However, Pergson’s shocking strength had put him under a lot of pressure, forcing him to cultivate even harder. Nie Tian had not only fully recovered the powers he had consumed during his battle against Pergson, but also refined his spiritual core and three vortexes of different powers a few more rounds. He had a feeling that he was ready for his next breakthrough in cultivation. “Now I need to find an opportunity to enter the late Worldly realm,” he thought to himself. It had only been a few months since he had entered the Shatter Battlefield. He had never expected that he would have progressed so fast. He assumed this was because he had benefited from his battle against Pergson, who had pressured him so much that he had cultivated madly to improve his battle prowess. Yin Yanan’s air-transportation spiritual tool came to a open, desolate land scattered with a large number of huge rocks. Those huge rocks seemed to be from a magnificent city, before a fierce battle had toppled it. Now, broken stone pavilions, rubble, and weeds were all that were left. From the look of it, this stone city had been here for hundreds of thousands of years. At this moment, human Qi warriors could be seen bustling in the ruins, as if they were looking for something. Some of them had clearly noticed the arrival of Nie Tian and the girls, yet none of them bothered to call out to them. Standing on the air-transportation spiritual tool, Nie Tian listened to their conversations with rapt attention. After a short while, he said with a surprised expression, “This was a stone city that belonged to Stone Golems. A Stone Golem clan lived here during the Desolate Antiquity Era. The fierce war between the Ancientspirits and outsider races destroyed this city. Nie Tian didn’t oppose the idea. After all, eight of the stone statues had displayed strength that matched the strength of Void domain experts. After a brief stay, their air-transportation spiritual tool headed out again. However, as they flew over the center of the stone city, their air-transportation spiritual tool seemed to be caught in a huge net, and was yanked down from the air. The Qi warriors who were close to where they crashed looked over with disdainful smiles, as if they were looking at three bumpkins. Hey guys, I've gathered some materials about Daoist talismans that I find fascinating, which I plan to introduce to you over the next few days. Hope you'll find them interesting as well. In the process of conducting magic skills, Daoists usually make use of the mysterious functions of Talismans and Registers. Usually in Daoism, only those who have been imparted Talismans and Registers are qualified to be ritual masters in activities of carrying out magical skills. Magic arts cannot be done without Talismans and Registers as well as incantations, finger gestures, and Big Dipper pacing. That's why we'd like to talk about Talismans and Registers first when discussing magic skills. Talismanic writings are all written in twisted characters, and look like drawings as well as calligraphy. The talisman is mainly used to invoke and impeach ghosts and cast spells in order to control the evil spirits. All of the registers are simplified books ( 素書 Sushu ), in which are inscribed the numbers of the heavenly officials. With talismans mixed into them, the writs are exceptionally strange and cannot be recognized by the ordinary people. At the same time they are considered as trusts to prove that a man has become a Daoist and also as a symbol of his right to control the divine officers on the talismans, and to conduct magical skills. 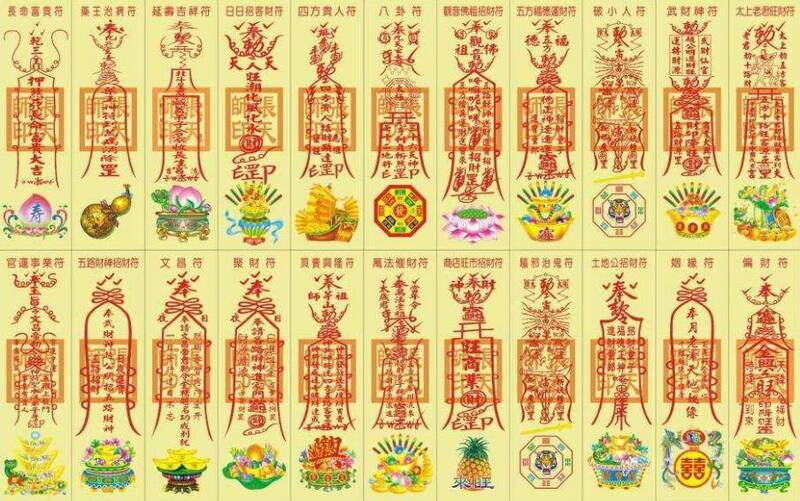 Traditionally, Daoist sects characterized by imparting Talismans and Registers are said to belong to the Talisman and Registers tradition ( 符籙派 Fulu Pai ), but the use of Talismans and Registers is not restricted to these sects. When the Golden Elixir Sect ( 金丹派 Jindan Pai ) sets up an altar, it also applies Talismans and Registers. The Complete Perfection Tradition ( 全真道 Quanzhen Dao ) that sprang up in the Jin Dynasty paid more attention to Refinement and Nourishing Life. Nevertheless, its founder Wang Chongyang once applied talismans, and in the days after the Seven Perfect Ones of the Complete Perfection, adherents of the sect often applied talismans when they were invited by the imperial court or by officials to conduct grand Fasts and Offerings ( 齋醮 Zhaijiao ) of various kinds. Therefore some Daoists have said that the secret of magic arts are merely talismans, vital breath and medicine. Talismans, divine medicine and skills of vital breath are all elementary factors of Daoist magic skills.